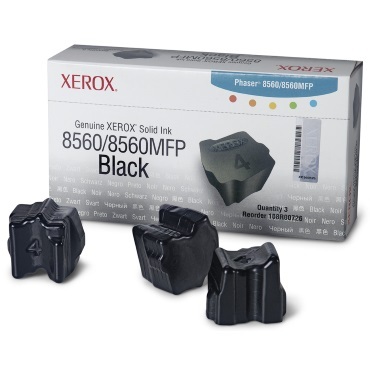 Create your own Xerox Phaser 8560 solid ink pack / bundle with our flexible quantity discount pricing. Mix and match products so you are only purchasing what you need, but also maximizing your savings. Compatible Cyan Solid Ink Sticks with 3,400 page yield. Equivalent to Xerox part number: 108R00723. Fits the following model(s): Xerox 8560, Xerox 8560N, Xerox 8560DN, Xerox 8560DT, Xerox 8560DX, Xerox 8560MFPN, Xerox 8560MFPD, Xerox 8560MFPT, Xerox 8560MFPX. Compatible Magenta Solid Ink Sticks with 3,400 page yield. Equivalent to Xerox part number: 108R00724. 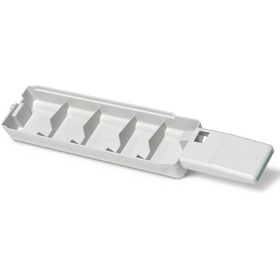 Fits the following model(s): Xerox 8560, Xerox 8560N, Xerox 8560DN, Xerox 8560DT, Xerox 8560DX, Xerox 8560MFPN, Xerox 8560MFPD, Xerox 8560MFPT, Xerox 8560MFPX. Compatible Yellow Solid Ink Sticks with 3,400 page yield. 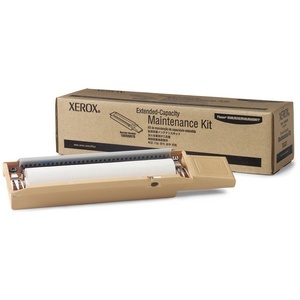 Equivalent to Xerox part number: 108R00725. Fits the following model(s): Xerox 8560, Xerox 8560N, Xerox 8560DN, Xerox 8560DT, Xerox 8560DX, Xerox 8560MFPN, Xerox 8560MFPD, Xerox 8560MFPT, Xerox 8560MFPX. Compatible Black Solid Ink Sticks with 6,800 page yield. Equivalent to Xerox part number: 108R00727. Fits the following model(s): Xerox 8560, Xerox 8560N, Xerox 8560DN, Xerox 8560DT, Xerox 8560DX, Xerox 8560MFPN, Xerox 8560MFPD, Xerox 8560MFPT, Xerox 8560MFPX. 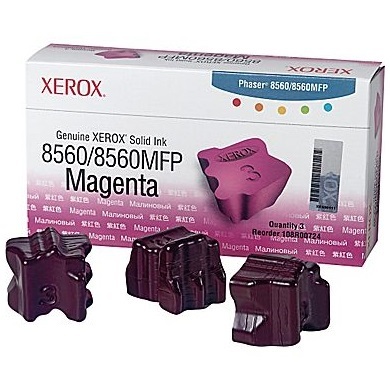 Buy our high quality compatible ink for Xerox Phaser 8560 with confidence. Join thousands of happy customers who have found our compatible products are equivalent in page yield and print quality. For our compatible products, we offer a 100% Satisfaction Guarantee allowing you to return products within 6 months if you are unsatisfied. Step by step video showing you how to change the Xerox Phaser 8560 series ink sticks. With many models to choose from the Xerox Phaser 8560 is a printer that can adapt to almost any need and budget. The 8560N is the inexpensive base model which includes networking. The 8560DN adds automatic duplexing. The 8560DT augments the previous features with extra paper capacity and twice the RAM, and the 8560DX add even more paper capacity to the mix. All of these use the same Xerox 8560 ink. With solid ink printers only recently beginning to gain popularity, many are unaware of their benefits. 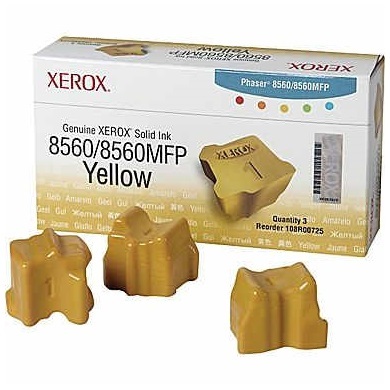 In addition, Xerox Phaser ink can be found easily on our website. 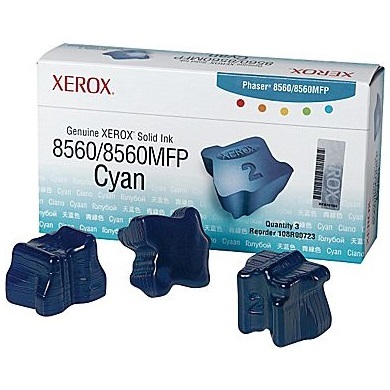 Xerox 8560 ink is generally much less expensive than comparable laser cartridges. Phaser 8560 ink sticks also require no cartridge and leave no waste or byproduct behind when consumed, making them a better choice for an environmentally-friendly printing solution. Further, Xerox 8560 ink sticks can print on a wider variety of media, giving users more freedom and flexibility. Replacing Phaser 8560 ink is a very simple process as they are clearly marked and notched to avoid accidental mix-ups. 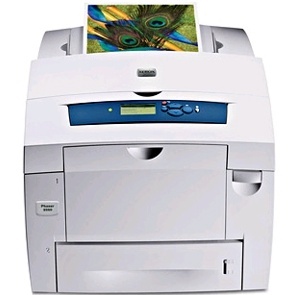 Whether you have a small or large office, the Xerox 8560 can be a very good choice. Small offices may choose the base model, but its many upgrade options allow it to expand as your office grows. Large offices will be pleased with its 85,000 page monthly duty cycle and 600 MHz processor, which ensure that it can handle even the largest printing volume. Nearly every feature is upgradeable or expandable, allowing buyers to tailor the machine to fit their individual needs. With so many advantages, it may not be long before solid ink printing and its budget-friendly printer ink become the dominant technology used in business environments versus the traditional ink cartridge. The Xerox 8560 is certainly one of the best values in its class, and its eco-friendly printer ink and cost savings will be easy on the budget both now and in the future.